Photograph of Richard Warren Wilkinson. No date. Courtesy of Sloan's Restaurant, Charlottesville, Virginia. 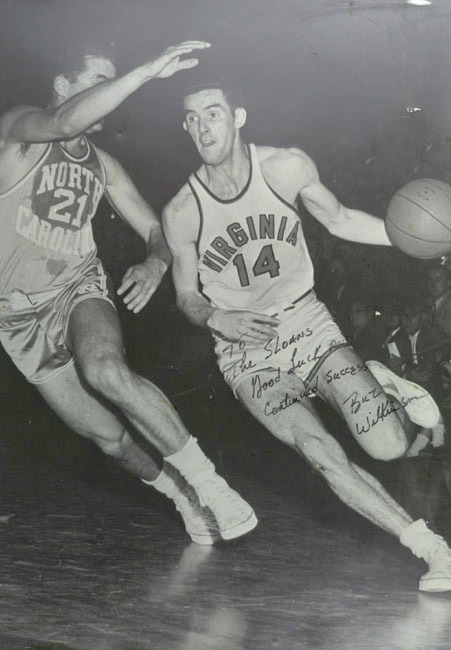 The legendary hoopster, Richard Warren "Buzzy" Wilkinson, brought basketball out of obscurity and into center stage here in Cavalier country in the 1950s. Standing 6'2", this agile guard-forward thrilled the fans while setting records that stand to this very day. A prolific scorer, he averaged 30 points per game, and totaled 2,233 points during his career from 1953-1955. An all-American and captain of the team, he was the first in basketball to have his jersey retired, the second in UVa athletics. "Buzzy" was drafted by the Boston Celtics in 1955.